Below is my “Big Day Out” column from the Saturday, March 23, 2013, Swansea edition of the South Wales Evening Post. 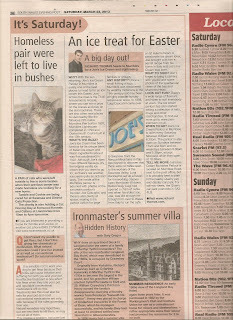 RICHARD THOMAS heads to Mumbles for a Joe’s Ice Cream and some sightseeing. WHY? With the sun returning Joe’s Ice Cream Parlour in Mumbles is the best place to head to for an ice cream this Easter. Just across the road is the Tivoli Amusements Arcade where you can win a prize on the cranes and play on the slot machines. There are also other neat places to visit nearby like the fabulous 225 metre Mumbles Pier built in 1807, Mumbles Lighthouse completed in 1794 and Oystermouth Castle built in the 13th century. WHAT’S THE BUZZ? Joe’s Ice Cream has been famous for its unique blend of Italian ice cream and Welsh ingredients since it was first established in 1922. Although Joe’s do have different flavours, it’s the original vanilla ice cream that you want to go for, as there’s not another ice cream quite so rich and tasty. The inside of the Mumbles parlour is adorned with photos of the ice cream parlour’s founder, Joe Cascarini, and there is also plenty of space, making it the perfect option for large families or groups. ANY HISTORY? Once a small fishing village, Mumbles was discovered by wealthy Victorians in the 19th century and has been a highly popular holiday retreat ever since. In 1898 Luigi Cascarini came over to Swansea from the Abruzzi Mountains in Italy. Astonished to discover that there were no cafes open to the workers of the Swansea valley, Luigi decided to setup a haven for the working classes open from dusk till dawn. Before long, Luigi had opened a chain of cafes and when his eldest son, Joe, was old enough he brought him over to Wales from Italy to run the café on St Helens Road. A passionate ice cream lover, Joe brought with him from Italy a secret recipe from his home in Italy and Joe’s Ice Cream was born. LOOK OUT FOR? There's a wide range of flavours and sizes to suit everybody at Joe's. The ice cream parlour have also started selling a collection of hats, mugs and other merchindise, to find out more go to www.joes-icecream.co.uk. WHAT TO TAKE? Don’t forget to bring a camera with you to take some photos of the spectacular views of the bay and Mumbles Head. WHEN TO GO? Joe's Ice Cream Parlour in Mumbles is open every Saturday between 9.30am and 6.30am. The parlour is also open on Sundays between 11am and 6pm and on weekdays between 9.30am to 5.30pm, except Mondays when they open at 10.30am. TELL ME MORE: Joe’s Ice Cream Mumbles Parlour is located on Mumbles Road, next to the post office, but it is probably best to park in the nearby Quarry pay and display car park. For sat-nav users the Quarry car park postcode is SA3 4LQ. 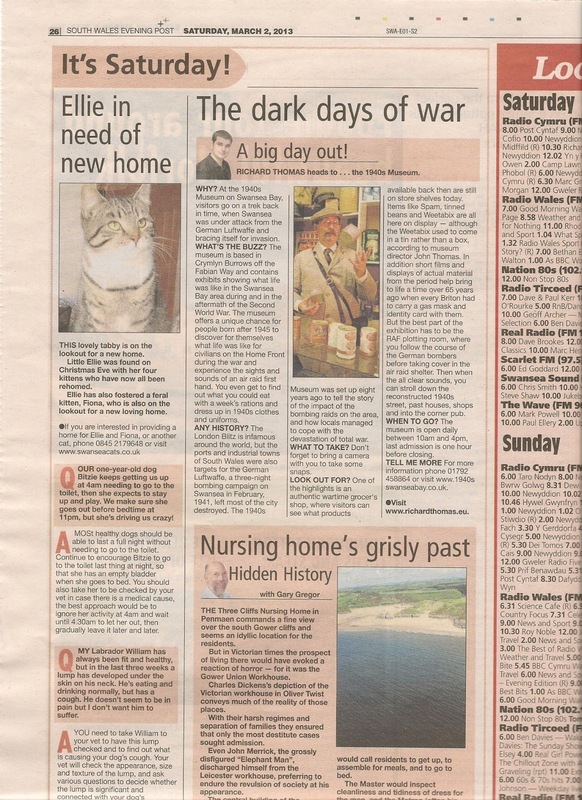 Below is my “Big Day Out” column from the Saturday, March 16, 2013, Swansea edition of the South Wales Evening Post. WHAT’S THE BUZZ? Measuring 330 meters in length and consisting of an exciting mix of tight bends, sweeping curves and great long straights, the 6 meter wide main track allows for plenty of overtaking opportunities and provides plenty of challenges for even the most experienced go karter. There’s also a great track for younger drivers, providing plenty of fun but still nice and safe with a secure pit lane area for safe pit stops. Children as young as three can take part. There are three types of kart available: electric KIDZ KARTZ that travel up to 6 miles per hour for three to eight year olds, SODI FUN KID petrol karts for eight to twelve year olds, and the worlds most popular kart the SODI GT4 for adults. LOOK OUT FOR? Along with two great tracks there is also a games room with driving simulators where you can get some practice before you go on the track, a pool table, air hockey table, and a cafe serving light refreshments to check out. ANY HISTORY? Skidz Karting opened last year. Although a popular sport in Europe today, go karting first began on the other side of the Atlantic. Art Ingels is thought to have built the world's first go kart in 1956 in California. Go karting quickly caught on with tracks built in many towns and cities across the United States. WHEN TO GO? During the school term the go karting tracks are open daily between 12pm and 8pm, except Mondays when the tracks are closed. During school holidays Skids Karting is open seven days a week from 10am to 12pm. 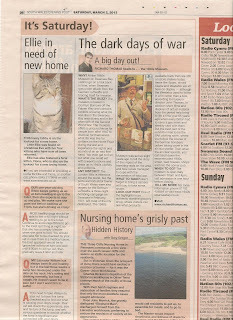 Below is my “Big Day Out” column from the Saturday, March 9, 2013, Swansea edition of the South Wales Evening Post. RICHARD THOMAS heads to The National Waterfront Museum in Swansea. WHY? Jam-packed with the latest interactive technology married with traditional displays, the National Waterfront Museum in Swansea offers visitors a unique and fully involved learning experience for the 21st century. WHAT’S THE BUZZ? The National Waterfront Museum at Swansea tells the story of industry and innovation in Wales, now and over the last 300 years. The museum uses a collage of real life artefacts, archive footage and photographs, 2-D graphic panels, video diaries and various and often ingenious interactive computer displays, to bring Wales’ industrial and social history vividly to life for visitors. ANY HISTORY? The museum has more than 100 historical artefacts from Wales’ industrial past. Formerly the site of the Swansea Industrial & Maritime Museum, the new National Waterfront Museum was opened in October 2005. The museum building itself is a synthesis of contemporary architecture and Welsh history. The building eloquently combining a Grade II listed former dockside warehouse built in 1902 with a 21st century glass and slate structure, designed exactly a century later by Stirling Prize-winning architects Wilkinson Eyre. WHAT TO TAKE? Admission is free but you might want to purchase some keepsakes in the museum’s gift shop, where the money you spend is gifted back to the museum. Visitors wishing to take photographs will be required to complete a Declaration Form available from the Information Desk, but this doesn't take long so bring a camera. LOOK OUT FOR? One of the most memorable exhibits is a detailed scale model of the 1865 steam ship Zeta, after which Swansea-born Hollywood actress Catherine Zeta Jones was named. There’s also a replica of the world's first steam locomotive, built by British inventor Richard Trevithick, which made its first journey along the tramway of the Penydarren Ironworks, near Merthyr Tydfil in 1804. WHEN TO GO? The museum is open from 10am to 5pm daily. TELL ME MORE: Located in Swansea's Maritime Quarter, The National Waterfront Museum is less than half a mile from the city centre. A pay and display car park is situated just a short walk away from the Museum on Oystermouth Road. For sat nav users the postcode is SA1 3RD. 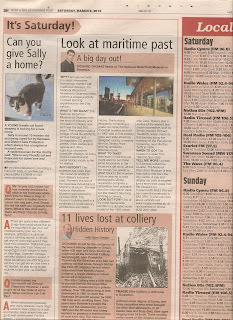 To find out more about exhibits visit www.museumwales.ac.uk/en/swansea or phone (029) 2057 3600. 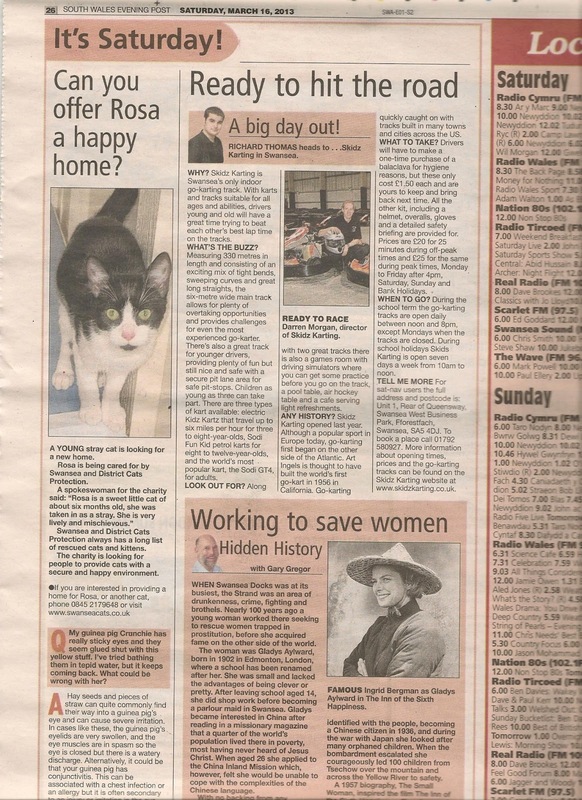 Below is my “Big Day Out” column from the Saturday, March 3, 2013, Swansea edition of the South Wales Evening Post. RICHARD THOMAS heads to the 1940s Museum. WHY? At the 1940s Museum on Swansea Bay, visitors go on a trek back in time, when Swansea was under attack from the German Luftwaffe and braising itself for invasion. WHAT’S THE BUZZ? The museum is based in Crymlyn Burrows off the Fabian Way and contains exhibits showing what life was like in the Swansea Bay area during and in the iaftermath of the Second World War. The Museum offers a unique chance for people born after 1945 to discover for themselves what life was like for civilians on the Home Front during the war and experience the sights and sounds of an air raid first hand. You even get to find out what you could eat with a week’s rations and dress up in 1940s clothes and uniforms. ANY HISTORY? The London Blitz are infamous around the world, but the ports and industrial towns of South Wales were also targets for the German Luftwaffe, a three-night bombing campaign on Swansea in February, 1941, left most of the city destroyed. The 1940s Museum was set up eight years ago to tell the story of the impact of the bombing raids on the area, and how locals managed to cope with the devastation of total war. LOOK OUT FOR? One of the highlight is an authentic wartime grocer's shop, where visitors can see what products available back then are still on store shelves today. Items like Spam, tinned beans and Weetabix are all here on display - although the Weetabix used to come in a tin rather than a box, according to Museum director John Thomas. In addition short films and displays of actual material from the period help bring to life a time over 65 years ago when every Briton had to carry a gas mask and identity card with them. But the best part of the exhibition has to be the RAF plotting room, where you follow the course of the German bombers before taking cover in the air raid shelter. Then when the all clear sounds, you can stroll down the reconstructed 1940s street, past houses, shops and into the corner pub. WHAT TO TAKE? Don’t forget to bring a camera with you to take some snaps. WHEN TO GO? The Museum is open daily between 10am and 4pm, last admission is one hour before closing. TELL ME MORE: For more information phone 01792 458864 or visit www.1940sswanseabay.co.uk.